1 of 3 In a small bowl, whisk olive oil, vinegar and mustard. Stir in shallots, 1/4 tsp of the salt and the pepper. 2 of 3 Bring a pot of lightly salted water to a boil. Add asparagus; cook for 1 minute. Drain and run under cold water to cool. 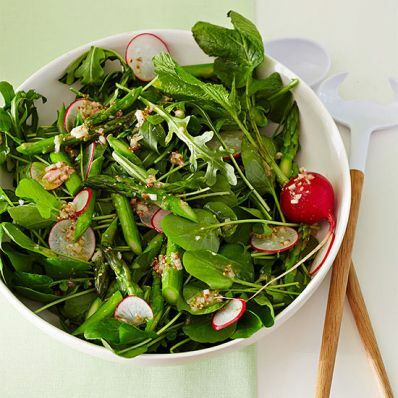 3 of 3 In a large bowl, toss asparagus with watercress, arugula and radishes. Right before serving, stir in remaining 1/4 tsp salt and the dressing. Per Serving: 0 mg chol., 47 kcal cal., 4 g Fat, total, 174 mg sodium, 1 g fiber, 2 g pro., 1 g sat. fat, 3 g carb.